Here is a mudra for grounding to Mother Earth. It is good for whenever a person feels spacey, or just too out there on the astral plane. Very easy! Image: “Mudra for Grounding to Mother Earth,” photo and adaptation by Alice B. Clagett, 7 October 2014, CC BY-SA 4.0, in “I Am of the Stars,” https://awakeningwithplanetearth.com .. Sit on the ground, if possible. A porch (‘semi-outdoors’) would be a second choice. You can sit in easy pose (crosslegged) as shown, or on a chair, with your feet firmly on the ground or porch floor. 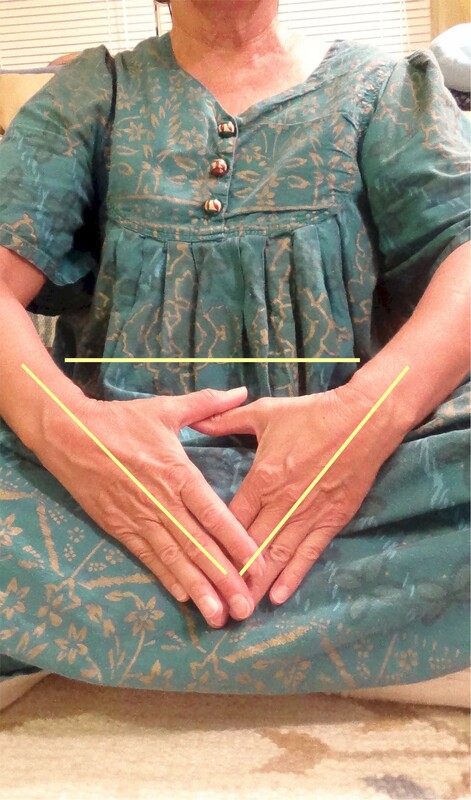 Form a triangle with the fingers of both hands, as shown in the picture. The tips of the joined fingers are pointing down to Earth. With your will power (your third chakra) visualize a second triangle, as shown by the yellow lines in the picture. The top of this triangle is at the level of your third chakra (your navel point energy, or will power, at the level of your umbilicus). The force field proceeds downward through your arms and is channeled down to Earth through your joined fingers. Video: “om mani padme hum,” by batesaurio, 27 July 2008 … https://www.youtube.com/watch?v=iG_lNuNUVd4#t=12 .. The feeling at the navel point is like that of a warrior. (1) For more on this mantra, see: LInk: “Om Mani Padme Hum,” in Wikipedia, https://en.wikipedia.org/wiki/Om_mani_padme_hum .. This entry was posted in Drawings by Alice, Grounding - earthing, Meditations - visualizations, Mudras and kriyas, Mudras and kriyas by Alice, Yoga and tagged 2u3d, grounding, grounding to Earth, meditation, Mudras and kriyas, Yoga, ZZ- Awakening with Planet Earth on 7 October 2014 by Alice B. Clagett.